Brewed during October 2017, this old ale had some Top Sekrit ingredients thrown into the boil to give it some extra oomph. 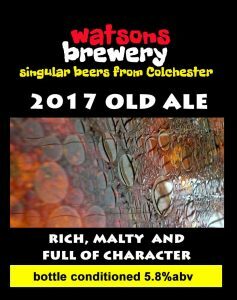 A single cask went on at The Victoria Inn in Colchester, for their Tryanuary event on Friday 26th January 2018 and was very well received (Untappd reviews here). Some bottles will be released during 2018. Watch this space.